Figure 7.23. Comparison among propulsion systems, including a high-temperature MITEE rocket, for interplanetary missions (MITEE http://www.newworlds.com/mitee.html). Although meant to be reasonable projections (no such engine has been built or tested so far), these are indeed extremely interesting figures, making the MITEE concept a good candidate for certain future interplanetary missions. The MITEE concept is still evolving. A version has been proposed to shuttle the International Space Station back and forth between Earth and Moon orbits [Paniagua et al., 2008]. 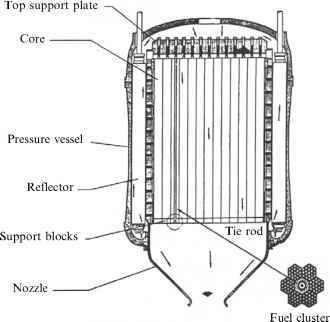 A variant of MITEE would use part of the reactor waste heat to reheat hydrogen after expansion, re-compressing it and extracting further work from the thermodynamic cycle [Powell et al., 1999, 2004]. This cycle becomes similar to the classic turbine interstage reheating proposed some 50 years ago by Brown Boveri and recently implemented in advanced gas turbines manufactured by Alstom in Switzerland. Since excess turbine power production is inevitable, hydrogen could also be electrically heated. According to the authors, total power transferred to hydrogen could raise its temperature to ^3,900 K using multiple cycling; correspondingly, the Isp should increase to ~ 1,250 s. While interesting, this strategy is cumbersome in terms of sheer amount of machinery needed. In fact, no turbo-machine power generator has ever been tested, officially at least, in orbit. This type of NTR is actually a hybrid between pure NTR and NEP engines, exploiting the heat that should be wasted in space by space radiators. The family of MITEE concepts is worth attention because of its compactness. In fact, combining some of the ideas from the MITEE designs with the basic Rubbia's engine proposal in Section 7.13 should result in a beneficial synergistic effect.